The incredibly popular party game is coming to your favorite high def systems just in time for the holiday season. 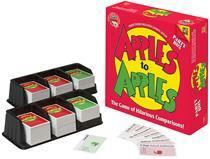 If you've never played 'Apples to Apples,' then you've been missing out on one of the most entertaining party games around. It's a simple word game that invites plenty of competition and lots of fun - perfect for a good group of friends or as an icebreaker for new folks. Starting this December, you'll be able to get in on the fun in digital form with 'Apples to Apples' for the PlayStation 3 and Xbox 360. You'll be able to play in the same room or over the internet with friends and family. Facebook and mobile releases are on the way too, but no timeframe has been announced yet. Here's where it gets really cool - the game is going to be cross-platform. The press release for the game says that mobile and Facebook gamers will be able to connect to one another. It doesn't specify whether Xbox and PS3 versions will be able to do the same, but it sounds like there's a distinct possibility.